So, I just signed on for NaBloPoMo again, and I’m trying to figure out if or how to shake it up a bit this year. I do know that I’m going to be crying on November 4th. And if those tears aren’t of the happy flavor, well, I just might throw in my stinkin’ towel and post stink-eye photos for the remainder of the month. Speaking of stinkin’ towels (sadly, my transitions lack imagination), I’m currently suffering from a case of the stinking towels. I’m not sure if this stems back to our Feces in the Basement (!) problem or the fact that I sometimes let things sit in the washer too long, but our towels smell like mildew. I dry my face with one, and then I spend the night smelling my soured fetid face. And I dry the kids’ hair with one, and then I send them to the car for the night so I don’t have to breathe in their rancid tresses. And when your friend sends you some incredible soap and then the smell of your supposedly clean towel completely chews up the good scent and spits foul yuck all over you, well, something has to give because it’s starting to affect my mood. As I type this letter to you, I am using (for the first time ever!) fabric softener laced with Febreze to try to kill the stink on the towels. Think happy thoughts. Also, Dear Jeff: Your underpants (for the first time ever!) are going to be surprisingly soft (and lavender scented!) tomorrow. Let me know if you need me to knit suspenders to hold them up. Author fluidpuddingPosted on October 21, 2008 October 21, 2008 Categories Cucumbers aren't always cool., Daily44 Comments on Greetings from Putrid Pudding! He kissed my cheek before bucketing my noggin. A few nights ago Ben Folds gently placed a bright pink bucket hat on my head and crowned me Queen of the Shirtless Crab Walk. When Jeff and I were shopping for wedding rings, we ended up at a jewelry store in a mall in Nashville, Tennessee. After making our selections (Jeff’s ring is gold with black ridges that remind him of record albums, mine is platinum and has eleven tiny diamonds embedded into the band for no real reason at all), we were asked if we wanted anything engraved onto the rings. Me: Yes. Put ‘My Only Friend, The End’ inside Jeff’s ring. Me: Yes. 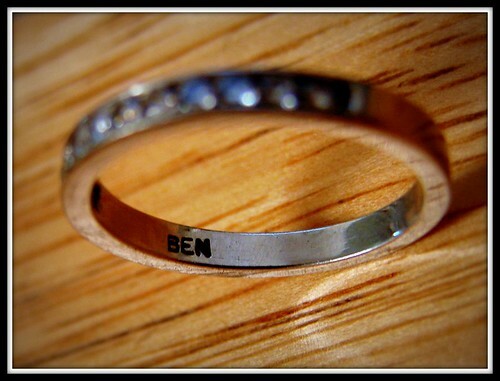 If engraving costs less than five dollars. After our wedding ceremony, it occurred to me that Jeff never answered the question about engraving. I slid the ring off of my finger, expecting (and sort of hoping) to find a fabulous William Gass quote. Instead, I found one word. Ben. Me: Jeff? Why did you do this? Jeff: Um, I didn’t do that. Actually, it sort of looks like the engraver screwed up someone else’s ring and then put it back into the case to be sold. Look at the messed up N.
Me (muttering a few expletives, some that begin with an F): I’ll be clearing this up when we get back to Nashville. We found our seats, we made out a bit (I might be stretching the truth on that one), and we prepared for the opening act. (Prepared = Continued to sit. We were very lucky to have seats.) Opening act? Missy Higgins. And during her first song I developed one of those I Want to Buy All of Her Albums Right Now crushes. I also want to figure out how to knit the cabled tank she was wearing. But you don’t care about that, do you? When we got home after the show that night, I sat up and watched The Office. And then I fell asleep and had a dream during which I was crab walking around The Pageant without my shirt on. (As I sometimes do. The employees are very patient.) I eventually found myself backstage balancing a bottle of beer in Billy Pancake, and Ben Folds walked up, bent down, kissed my cheek, and placed a bright pink bucket hat on my head. “You are Queen of the Shirtless Crab Walk!” he proclaimed as he tapped my head with his own bottle of beer, which is just as good as slipping an engraved ring containing eleven tiny diamonds onto the finger that holds the vein that runs directly to my heart or something. And it all seemed very Just Another Day in the Life. Author fluidpuddingPosted on October 19, 2008 October 19, 2008 Categories Daily, Make Out Parties, Review, Super Music Saturday25 Comments on He kissed my cheek before bucketing my noggin. I know you’ve been wondering about it. 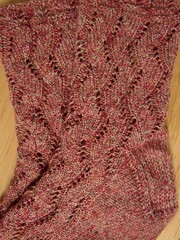 As you know, back in July I auctioned off a shawl to help fund my trip to San Francisco for BlogHer ’08. 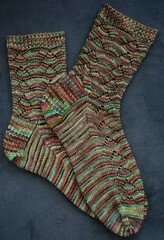 When the high bidder became the winner, I told her I was going to throw in a pair of handknit socks as a bonus. I then decided to add to the trip fund by selling more socks. (I know. You already know all of this. Sadly, I’ve become that person who tells you the same story 43 times. Outboard motor! Get it?! Out Bored Motor! It’s a joke about a worm! Hey! Do you want to hear a joke about a worm?) The specifics: I sold four adult-sized pairs of socks and seven sock ornaments in a 24 hour period. Those sales along with a freelance writing project purchased my plane ticket to San Francisco. And I still get all smiley with gratitude whenever I think about it. 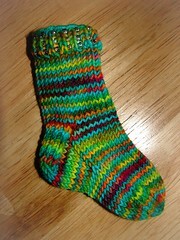 The sock-knitting frenzy began in July, and I set the goal of knitting one sock per week until the adult-sized socks were completed. As of last week, they have all been finished off and mailed away. 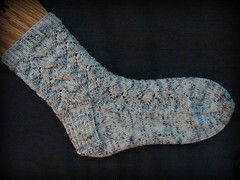 This is a pair of socks I started almost a year ago as a Pay it Forward gift. When I found out that the recipient was going to be at BlogHer and that her birthday was coming up, I finished them and delivered them to her in San Francisco. 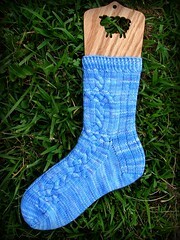 The very first paid pair of socks were for a friend and former co-worker of mine. They were delivered at the end of August. The yarn? It’s Woolly Boully “Moonflowers” yarn, and it’s SO pretty. The Oreo Monkeys went out at the very end of August, too. 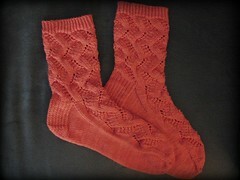 Done in Koigu, they’re possibly the softest socks I’ve ever made. And, Bonus: They look like smashed up Oreos. The Boysenberry Monkeys (also done in Woolly Boully) are on their way to Japan as I type this entry. How fun is that?! Believe me, it’s very fun. The Antique Monkeys were finished up last week and mailed off to one of my favorite internet friends. They should arrive in her mailbox today. 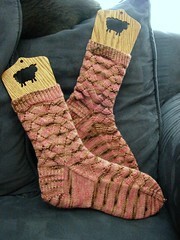 This afternoon I finished the first of the seven sock ornaments. (They are scheduled for mailing in late November or early December.) 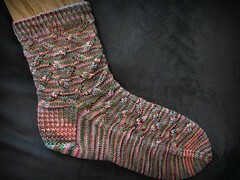 After that, I have two more pairs of gift socks, and then I can close the book on The BlogHer Sock Project. Thanks again to all of my sock people. Author fluidpuddingPosted on October 9, 2008 October 9, 2008 Categories Daily, Knitting19 Comments on I know you’ve been wondering about it. The new Ben Folds album came out today. And now I’m getting ready to bail for work. Author fluidpuddingPosted on September 30, 2008 October 1, 2008 Categories Daily, Working Girl12 Comments on Taciturn Tuesdays! Down the basement, lock the cellar door! Let’s get right down to business, shall we? During the five minute drive from my parents’ house to the Elks Lodge, I explored my feelings with Jeff. Me: Jeff, I am unexpectedly scared about walking into the Elks Lodge. My flesh? It is crawling. Jeff: Is that you talking or the quesadillas? Me: I think the quesadillas are taking a well-deserved siesta for now. This is straight-on Me. Jeff: I wouldn’t worry. Unless the Elk are there. They eat bones, you know. We entered the building, and before I took the time to grab my name tag I was approached by two people from my old gang. (I recognized them immediately. Brown and gold bandannas, teardrop tattoos, and dangerously low-hanging jeans. Obviously, I’m kidding. Also, no disrespect intended to actual gang members, yo.) From that point forward, I felt like a character in Einstein’s Dreams. Who knew that time could actually accelerate as you stand with beer in hand and talk about the past? Biggest surprise of the night: One of the guys in my class has six grandkids. Not such a big surprise: There is only one person I know of who actively didn’t like me in high school. (Many people didn’t know me. Only one chose to be a hater. I suppose I’m lucky.) Anyway, I said hello to that girl in the bathroom, and although she looked right at me, she didn’t return the hello. And as I took care of business, I listened to her tell a story to someone, and it was one of the most boring stories I’ve ever heard in my life, and I kept thinking, “Really? You haven’t seen this person in twenty years and you’re telling THAT exasperating story? Please stop before I become the girl who fell asleep on the toilet at the reunion!” All of this to say: I’m sort of glad my water hasn’t gone under her bridge. Metaphorically speaking, of course. Oh! Oh! Later in the night, I saw her dancing to Poison’s “Talk Dirty to Me”, and she was doing that thing where you act out the lyrics as you dance, and when I saw her go down the baseMENT and LOCK the CELLAR DOOR! (complete with acting out the motion of going down stairs and turning a key in a lock) I had to smile. Because who does that? I’m cool with her not liking me. Author fluidpuddingPosted on September 29, 2008 October 8, 2008 Categories Daily, Social Awkwardness24 Comments on Down the basement, lock the cellar door! This video seems oddly appropriate today. 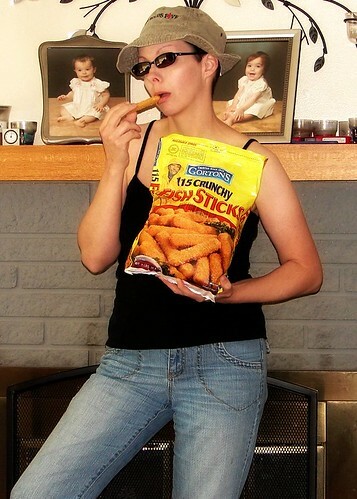 Twelve hours from now I’ll either be whooping it up at the Elks Lodge with two handfuls of mozzarella cheese sticks, two feet wobbling with mad crazy rhythm, and a tongue dripping with amicability (and cheese), or I’ll be back home. In my pajamas. With a wallet that’s fifty dollars skinnier and a heaping plastic tablespoon of No Ira Glass regret. Author fluidpuddingPosted on September 27, 2008 September 27, 2008 Categories Daily, Social Awkwardness, Super Music Saturday5 Comments on Super Music Saturdays! Pour some sugar on me, 1988. Okay, guys. I need some help. 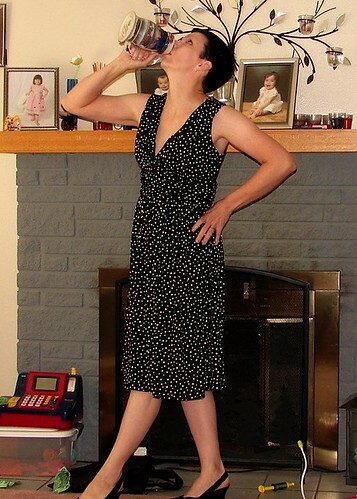 It seems that my 20 Year High School Reunion is in three days. I knew it was coming up. It is. In three days. This leaves me no time to lose those last few pounds, grow out my hair, or become a surgeon. If nothing else, I’m hoping (with your help, of course) that I can choose The Perfect Ensemble. This is where you come in. I’m about to give you three options. Please tell me which is most appropriate. Next up? The dress that shows a bit of cleavage. The final choice is a literal one. 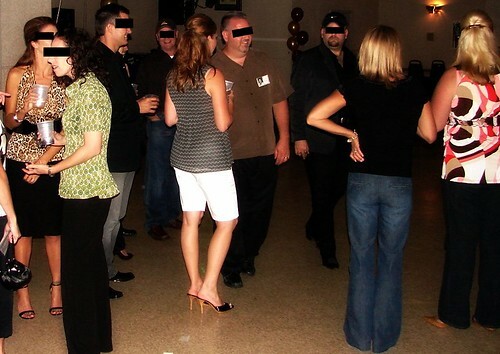 If you’re telling me that this event is truly casual, well, this is what you’re going to get. Author fluidpuddingPosted on September 24, 2008 September 27, 2008 Categories Daily, Social Awkwardness99 Comments on Pour some sugar on me, 1988. It’s the Autumnal Equinox Giveaway! A few weeks back I received an e-mail from the kind folks at Build-A-Bear asking if they could send a Hannah Montana bear to the girls, along with a $25 gift card to be given away at Fluid Pudding. Knowing that my kids would either fight over or just not get into the Hannah Montana bear, I went ahead and took it (with the card) and set the plan to give it all away. Adorable. Fuzzy. Soft. Wearing a glittery shirt that says Ready to Rock. And although it lacks the ability to mend bones, it did bring a smile to the recipient’s face. And that’s never a bad thing. All of this to say: If you’re interested in the $25 gift card to Build-a-Bear, I can hook you up. $25 would get you a naked Hannah Montana Bear (you can stage your own Vanity Fair photo shoot! 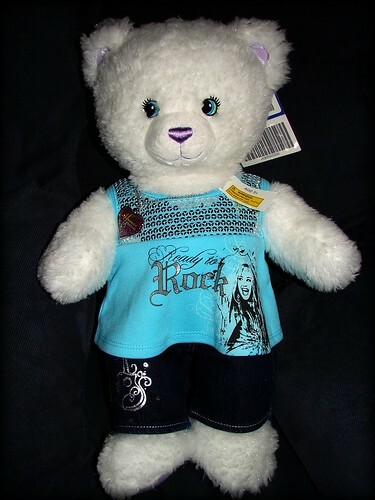 ), or just about any other Build-A-Bear friend. Best of all, Build-A-Bear sells donation animals. When you purchase a donation animal, a percentage of the proceeds is donated to charity. I hereby encourage you to use the card toward the purchase of a donation animal. Author fluidpuddingPosted on September 22, 2008 September 22, 2008 Categories Daily, Giving Stuff Away, Review, Shorties54 Comments on It’s the Autumnal Equinox Giveaway! I’m about to tell you about my Yesterday Morning. Do we have our accompaniment going? Okay then. Onward. Anyway, we grabbed some coffee, drove about ten miles, parked the car, and entered the store. When we walked in, the owner told me that she and another employee had just been talking about me. Long story short? She offered me a job. Working in a yarn store. And I know it’s totally hokey to be all “Pinch me! Am I dreaming? !”, but there you go. Also, I would scream out that thing about “Do what you love and the money will follow!”, but that’s sort of wilted, too. Rattlesnakes! Beat them with a baseball bat! So, yeah. Tomorrow I’m going in to talk details, and then fairly soon I’ll be working in a yarn store for a few nights each week. And, I’m excited. AND, I’m choosing to spend the next few weeks immersed in information. Because if someone comes in and says something like “Which right leaning decrease do you prefer?”, I don’t want to have to run and find a book. It was seven years ago today that I wore Capri pants to Starbucks and tried to impress a gaggle of high school boys by blasting The Weakerthans at them with my car stereo. And then I decided to sign up and document the experience at Fluid Pudding Dot Blogspot Dot Com, because I knew The World would give a crap. Also, because I’ll be wearing my Mommy Blogger bandanna tonight, let’s make this thing look as mommyblogesque as possible, shall we? Here’s a video of my kid! Cha cha cha! Thanks for making the past seven years so interesting.